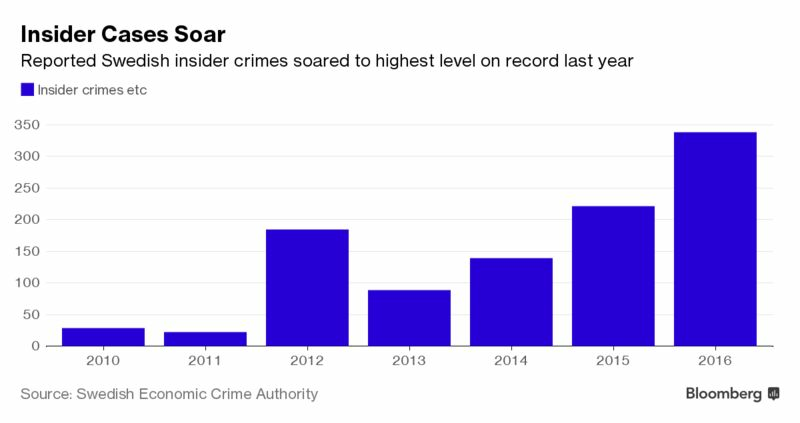 Bloomberg reports: One of the most honest places on the planet is in the grip of a financial crime wave. In the last month alone, Sweden has opened probes into possible wrongdoing by a billionaire, a former finance minister, the national property board, a former tech CEO and one of his company’s directors. The alleged crimes range from insider trading to bribery. Transparency International last week cited “leading people” losing their “ethical compass” in downgrading Sweden one level in the watchdog’s annual ranking of the least-corrupt countries — to No. 4 after Denmark, New Zealand and Finland. The Reputation Institute, a Chicago-based consulting firm, hailed Sweden as the world’s “most reputable” country just last summer. The number of insider crimes reported in this country of 10 million people soared 53 percent last year to a record 338, while the number of bribery cases jumped 47 percent to 246, a seven-year high, government data show. Authorities are cracking down on economic crime, enacting a new law on market abuse, criminalizing more “behaviors” and introducing harsher penalties. Gunilla Sandblom, the Economic Crime Authority’s chief prosecutor, said the surge in insider trading is particularly troubling because it can erode confidence in the country’s capital markets and deter investment. “The increase is serious,” Sandblom said by phone, attributing the spike in part to better oversight by regulators and an uptick in the number of listings by smaller companies inexperienced in vetting their own procedures. “During raids, we’ve seen documents containing insider information lying around the photocopier, allowing anyone working there to see and act upon it,” she said. Bloomberg: Fingerprint Cards AB – a technology company that as recently as 2015 delivered investors a 1,600 percent stock-price gain now finds its name at the center of a criminal investigation in Scandinavia. Sweden’s crime authority arrested current and former officials at Fingerprint Cards AB on suspicion of aggravated insider trading, sending shares of the maker of biometric sensors for smartphones to a 15-month low on Monday. Board member Lars Soderfjell and former Chief Executive Officer Johan Carlstrom were taken into custody, the Swedish Economic Crime Authority said on Monday. Authorities became suspicious after registering “large-scale sales” in Fingerprint shares before a Dec. 8 profit warning that subsequently pushed the stock down as much as 18 percent. The investigation marks a setback in Fingerprint’s attempts to distance itself from Carlstrom, who’s also been charged separately for insider trading while he was still CEO. Meanwhile, the company is struggling to stay competitive as rivals offer cheaper alternatives to the technology that brought Fingerprint to fame: sensors used by the likes of LG Electronics Inc. and Lenovo Group Ltd. The company says the arrests are linked to the individuals in question only, and don’t affect its operations. The Securities and Exchange Commission today announced that a Basel based Swiss trader has agreed to pay more than $2.8m to settle charges that he traded on nonpublic information ahead of a Florida-based biometrics company’s acquisition by Apple Inc.
An SEC investigation unearthed evidence that Helmut Anscheringer purchased stock and call options in AuthenTec Inc (which provides fingerprint sensors and software for use in electronic devices) having learnt from a friend related to an AuthenTec executive that Apple proposed to buy the company. The call options accounted for nearly all of the series volume on the days he purchased them. Just days later, AuthenTec publicly announced that it had agreed to become a wholly-owned subsidiary of Apple for $355m in cash. The positive news led to the stock price closing approximately 60% higher than the previous day. Through his unlawful trading, Anscheringer garnered more than $1.8m in illicit profits. The Securities and Exchange Commission charged a CPA and his son in New York on Thursday, accusing them of conducting an insider trading scheme involving tips on nonpublic information that they sent in coded email messages disguised as discussions about golf. The SEC alleges that Sean R. Stewart, who is currently a managing director at a prominent investment bank, routinely tipped his father Robert K. Stewart with confidential information about future mergers and acquisitions involving clients of two investment banks where he has worked during the past few years. The elder Stewart, who is a CPA as well as the CFO of a technology company, allegedly cashed in on the tips by placing and directing highly profitable securities trades ahead of at least a half-dozen merger and acquisition announcements. The scheme generated approximately $1.1 million in illicit proceeds in a four-year period. In a parallel action, the U.S. Attorney’s Office for the Southern District of New York today announced criminal charges against the Stewarts. According to the SEC’s complaint, there were additional ways the elder Stewart and his fellow trader attempted to conceal the scheme and evade detection when sharing nonpublic information obtained from Sean Stewart about investment bank clients. The SEC’s complaint charges Robert and Sean Stewart with violations of the antifraud provisions of the federal securities laws. Robert Stewart was arrested on conspiracy and insider trading charges this morning at his home in North Merrick, Long Island. Sean Stewart surrendered to the FBI on the same charges in Middleton, Wis., and is expected to appear in Manhattan federal court on Monday. Former accountant Ken­neth Carver was yesterday fined £35,212 by the Finan­cial Conduct Authority (FCA) for his part in the Logica insider trading scheme. Carver is a family friend of recently imprisoned Ryan Willmott who pleaded guilty to three counts of insider trading during his time as a financial planning and group reporting manager for IT management firm Logica. Willmott dealt on information he obtained regarding the takeover of Logica by CGI Group in May 2012 and has been jailed for 10 months. Carver bought 62,000 shares in Logica during the scheme and made a profit of £24,206.70 from selling the shares after they saw a 59.8 per cent rise from the takeover announcement. However, since Carver co-oper­ated with the FCA and settled at an early stage of the probe, his fine was reduced from the £122,212 it would otherwise have been.